I was browsing through some photos and I had stumbled upon this one. It appears to be a very creepy game that I might be interested in, unfortunately google image search did not return any results. What game does this belong to? 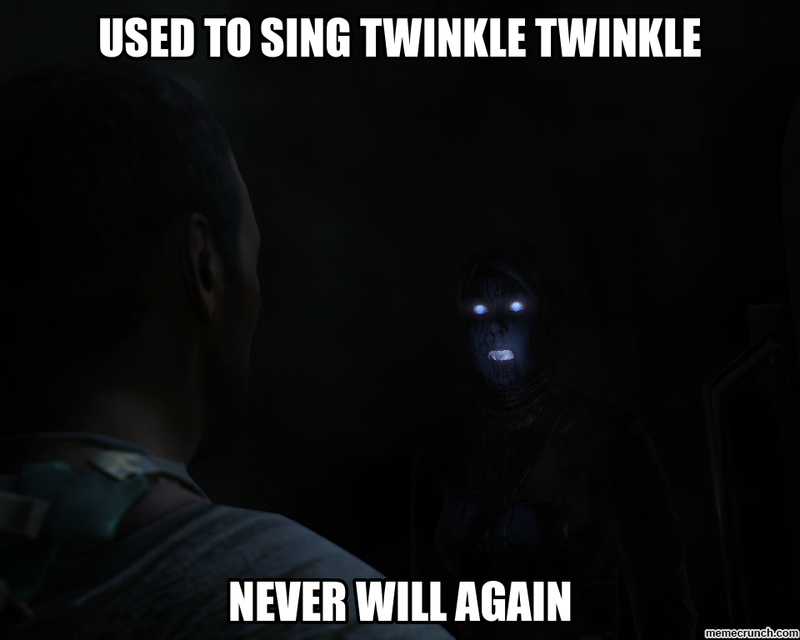 I am very curious on why I would never sing Twinkle Twinkle Little Star again. Dead Space 2, Ive seen the beginning of that game too many times not to know. As Daniel Seales wrote, the picture is from the Dead Space 2. I highly recommend watching it, it is one of my favorite trailers of all time. The trailer was also featured in the game as screensaver for the main menu, and can be heard in a few times in the actual game and in its sequel. Without spoiling anything I can tell you that the picture is referring to one of more memorable moments when it can be heard. Dead Space 1 and 2 was a great examples of a sci-fi themed survival horror, If you like such things I highly recommend trying them. From which game is this image of picking a lock on a broken door? What video game are these ninjas in Pixels from? Which DOS game do these sprites of a little character and dragon come from?